That’s interesting because mine have quit appearing, unless it’s now hidden somewhere in a different place. Here is what my collection screen looks like.... See which view you have above "Move Selected"
Once you click on “ collection” from the dropdown in the upper right, you should have a top row that shows the values, plus three little symbols, the lines which changes the page view, the dice which will randomly pick one album, and the gear which is a tools menu. Maybe fiddle with gear icon. Thanks! Maybe a lot of it has to do with that I only look at it with my iPhone, but before they changed the format, the overall value used to pop right up. Valid point! Kinda useless without it actually. Many if not most listings for vintage era records on discogs are incorrect and result in an overestimated value. Also it is only worth what you could sell it for within reasonable time. I value a collection based on what I can sell it for a lot to a dealer. My collection is probably worth 500,000 on discogs but actually about 2500 in reality. Record values have mostly dropped considerably from a couple years ago which is not figured into it either. No clue, as I have not noted condition on any of my recordings, plus I've seen it fluctuate more than a $1,000.00 difference in a 24 hour period. A nice free way to organize though. Keeps me from having to get up to see what I have too ! The prices on the site are based on most recent sales. My collection has been going up the past few years, and especially the past couple. This is really just statistics that discogs provides, and is not meant to be the gospel of record values. If your records are worth $500,000 on discogs, I'll give you $25,000 cash on the spot for it. black sheriff, Skychan, Dave and 2 others like this. It's crazy what has happened with vinyl over the past seven years. Are you sure you haven't just bought another $22,000 - $71,000 worth of vinyl in the past few years? black sheriff, ilo2, pscreed and 3 others like this. Min A$107,785 Med A$176,105 Max $298,315. I have over 11,000 items listed in my collection on discogs. Spent most of Christmas holiday break a few years back listing the vinyl. I’m not a beach person and prefer to spend the Australian summer indoors out of the sun. Have slowly added the CD collection since and had everything in about a year ago. I now add new purchases as I get them. Nerdy like that! I agree condition comes into it but the discogs value is a bit of an indication. Better than a wild guess. 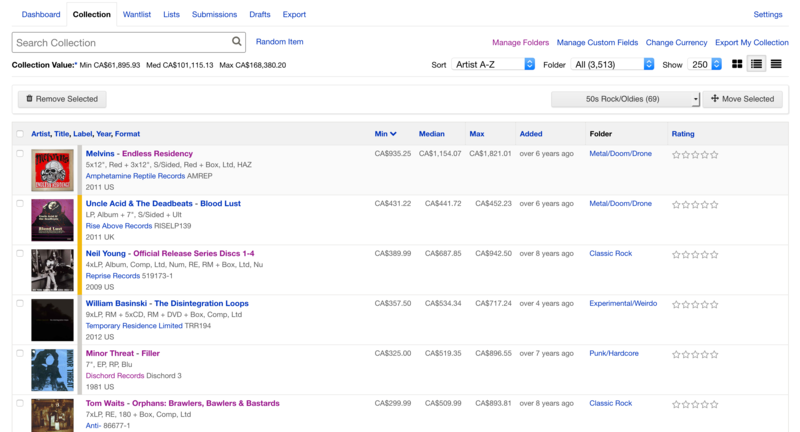 And I can check the condition on a record by record basis on the more valuable items and compare to the sales history in discogs of same graded items. Where having everything listed on discogs is most useful though is when I’m in a shop and can’t recall if I have something or not. I pretty much just buy vinyl these days and mostly 60’s and 70’s releases. So the phone comes in and out of the pocket a lot when I’m shopping to check if it’s something missing from the collection and check on the price while I’m at it. Getting everything listed was a positive use of my time and has helped me avoid a lot of double ups. black sheriff and phish like this. Maybe $10K in actual dollars, but nothing approaching the increase in the value of vinyl. My most expensive record used to be about $300 and now it's closer to $900. I'm not on discogs and wouldn't want to be. What's your collection worth ? It's Only worth what someone is willing to pay for it. One mans first pressing mint condition LP more often than not is another mans load of old played to death old ****e.
Yes, that's exactly the point. 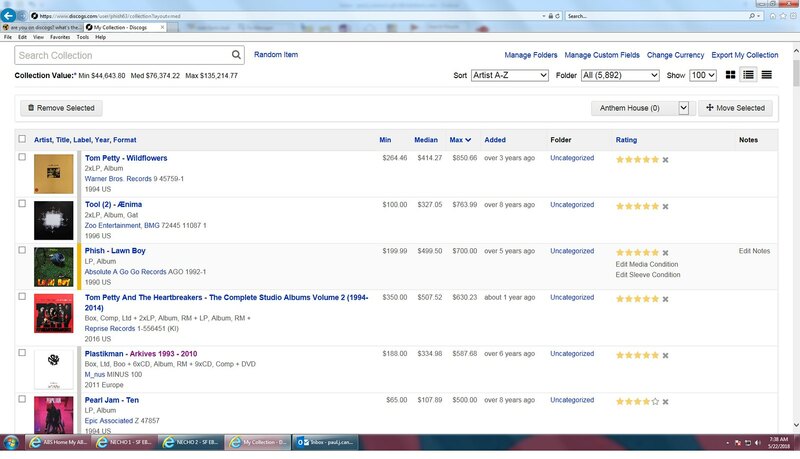 Discogs allows you to see what other people have been willing to pay for items like the ones in your collection. black sheriff, Romerovm, phish and 3 others like this. ::: Not sure the exact amount regarding Discogs registered sale figures of some items because a lot of Mexican Pressings haven't been uploaded -on my own I've tried to do so, but every now and then, a Discogs veteran wise guy sends messages to me like "your entry bla, bla, bla, you should bla bla bla, and also bla bla bla" so I got tired of that, despite theres a lot of my collection that could be useful for many collectors of other countries pressings of some artists. Yes, I've also been discouraged from listing missing titles from the discogs inventory due to grumpy old chaps claiming there's a comma missing or something trivial. I'm all for accuracy but it's a time consuming process and its seems you are more likely to be pulled up for an incorrect detail than thanked for the 99% that is right. So I leave it to the perfectionists to make the new entries and keep a list of things I own that aren't on the site. Usually they turn up over time. I think adding a different pressing to an existing database is a process they could simplify. There are also a lot of things without values as they've never sold. Or haven't sold enough to accumulate a sales history. Eventually they get enough data to show a value. rod, Gumboo and aravel like this. ::: I'm on your side on that Harvey, there's a lot of Australian and Mexican Releases that have different track list, sleeve, bonus songs, limited editions and the likes that I'll be glad to add to the data base: I even use my own scanner for details on images but, youre right, it takes time and sometimes it's not enough! Regards from Mexico. I think adding a different pressing to an existing database is a process they could simplify. To add a different pressing, all you have to do is go to the bottom of the master release and click Add a Release, and it duplicates all the existing information and you can go in and edit.